The Florida Fish and Wildlife Conservation Commission (FWC) needs your help in monitoring fish health by tracking marine and freshwater fish kills in Florida. FWC scientists monitor and document fish kills and diseases, as well as other aquatic animal health issues and associated environmental events. Many factors can contribute to a fish kill. The good news is that most natural water bodies are resilient to fish kill events. 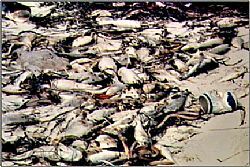 The public can report fish kills to the FWC at MyFWC.com/FishKill or by calling the FWC Fish Kill Hotline at 800-636-0511. You can also submit a report through the “FWC Reporter” app on your iOS or Android mobile devices.